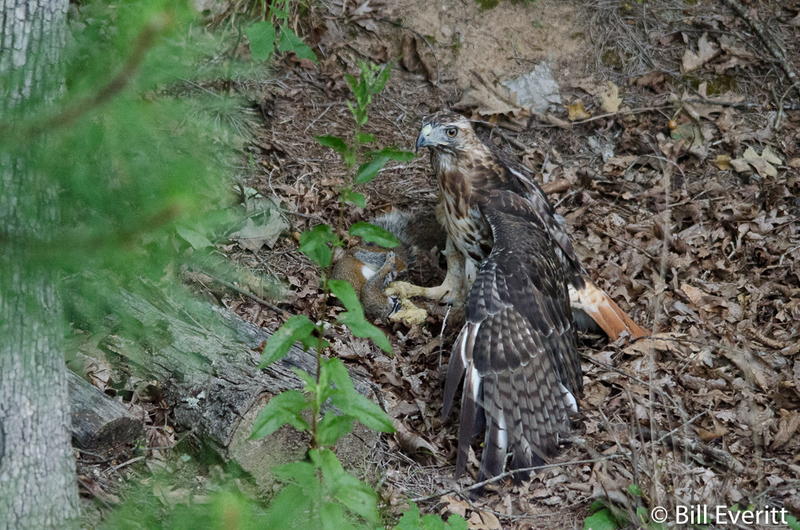 There are two hawks that are frequently seen here: the Red-tailed Hawk and the Cooper’s Hawk. The Red-tailed Hawk is of the genus Buteo while the Cooper’s Hawk is of the genus Accipiter. What’s the significance of the genus? Mainly that Red-tailed Hawks, a Buteo, will usually be seen soaring high overhead since that’s what they do: soar on thermals at mid-day over openings. Cooper’s Hawks on the other hand live and hunt in deeply wooded areas;  you’re more likely to see them down low on branches and even rooftops. So look up – way up. Often we can hear Red-tailed Hawks calling before we see them. Usually there is more than one, and they will circle high up in widening patterns. The Great Horned Owl occupies a similar ecological niche nocturnally to the Red-tail, taking similar prey. Competition may occur between the hawk and owl species during twilight, although the differing nesting season and activity times usually results in a lack of direct competition. Although the Red-tail’s prey is on average larger (due in part to the scarcity of diurnal squirrels in the owl’s diet), the owl is an occasional predator of red-tailed hawks themselves, of any age, while the hawks are not known to predate adult Great Horned Owls. 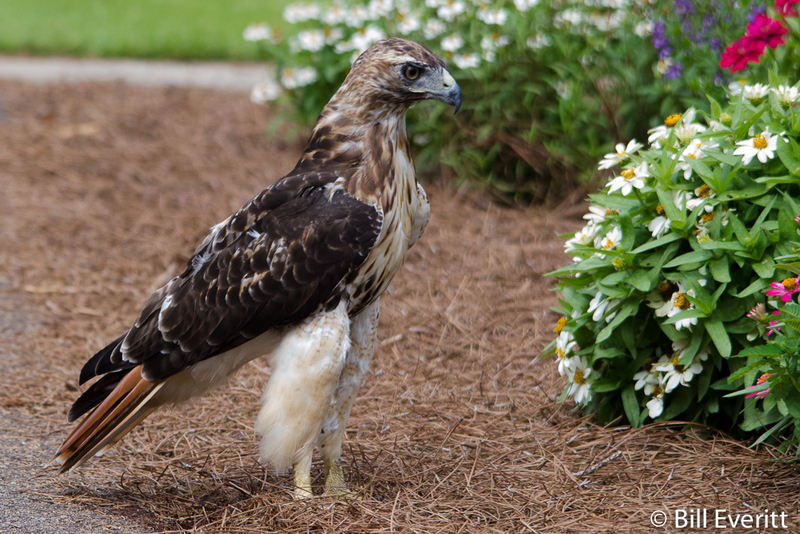 There is a Red-Tailed Hawk that is apparently a well known fixture at the State Botanical Garden in Athens. One afternoon he landed on the ground less than 10 feet away. He was not the least bit concerned that a person was there and hunted enthusiastically for five minutes in the flowers. 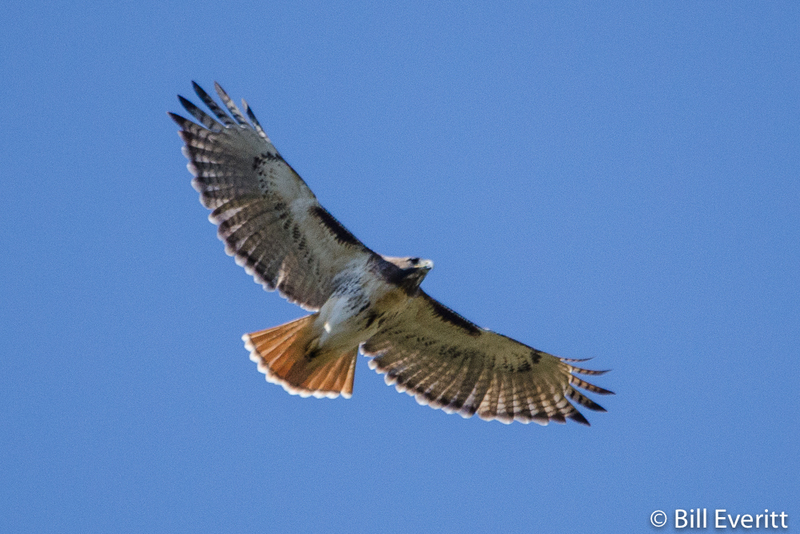 Most of our other sightings of Red-tails have been from 100 feet or more below them as they soar over the neighborhood.